For longtime readers, please forgive this twice-told tale. It appeared here back in January. I’m deep in the chaos of moving my office but will be back into my Carding Chronicles routine next week. The Carding Chronicles are stories about the little town no one can find on a map of Vermont. When you subscribe to the Chronicles, a new story is delivered to your inbox every Thursday. If you’re enjoying the Carding Chronicles, please share them with your friends! “How many do you think will show up?” Diana asked as her husband tried in vain to ease himself out of bed without waking her. “Do you want my help in the kitchen?” She turned over to see the shape of his body outlined by the glow from their clock radio. Stephen kept his boots off until he eased the back door of their second floor apartment closed behind him. Then he quickly shoved his clonking footwear over his toes, and clattered downstairs to the Crow Town Bakery. Shadows moved. “Yeow,” he yelled, leaping back from the bottom step. 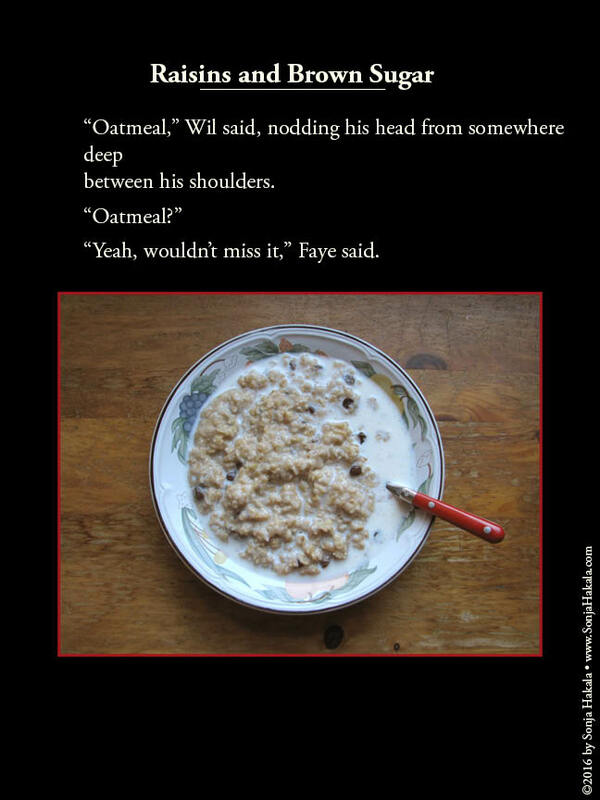 “Oatmeal,” Wil said, nodding his head from somewhere deep between his shoulders. “Your mother and I…,” Stephen began. “Wow, look at the crowd,” Wil said before his Dad could finish. Stephen’s head jerked up. Six heads bobbed up and down by the front door. “Hey, where have you been?” Ted Owens said as he stepped inside with his niece, Suzanna, and four more people behind them. “Sure,” Stephen said as he sprinkled salt into his palm then tipped it into the pot followed by a good shake of cinnamon and a slurp of vanilla. “What about you? I thought you didn’t like hockey?” Stephen said. Just then, Stephen saw his daughter’s eyes flick in the direction of Wil’s friend Brian, and he swore he saw a quick blush color her cheeks. Could it be…? Out in the front of the bakery, Paula piled bowls on a tray while Suzanna extracted a large jug of maple syrup from the refrigerator. As Ted counted out spoons, the excited talk reached a higher level, and then Stephen called out, “It’s ready.” He lifted the steaming pot of hot oatmeal from the stove, and everyone cleared a path so he could set it on the bakery’s counter. Lee Tennyson’s youngest son, a boy of only four, squeaked as he jumped up and down. “Ice. Ice. Ice,” he chanted. Behind him, his two older brothers imitated the slap and whip of a hockey stick meeting a puck. Bowls were filled, swirled with syrup, and puddled with milk. Everyone ate standing up while Faye circulated among them with a platter of hot bacon. Ted and Paula dispensed coffee in between bites of their own hot cereal. “Anybody know what the temp is outside?” Andy Cooper asked. “It was seventeen at our house when we left,” Lee Tennyson said. “Whoa, here come the firetrucks,” the four-year old squealed from the front windows. Two gleaming red engines eased their bulk over a low spot in the sidewalk surrounding Carding Green, their brakes hissing in the dark. Boots stomped, hats appeared out of deep pockets, and scarves were threaded around everyone’s neck. Then the bakery’s doors opened, and Carding’s ice-making team clomped out into the snap of a January morning in Vermont. The trucks’ pumps clicked on, droning mindlessly while water gushed out of their tanks. Three teams of three maneuvered the hoses so that the flow evenly filled the rink they’d constructed before Thanksgiving when the ground still accepted a spade. Wil and Lee set everyone else at regular intervals around the rink’s plastic liner to make sure it stayed in place. Stephen raced around the edge, eyeing the deepening water level, hoping they’d done a good enough job leveling the ground under the plastic. Last year, an unseen lump at one end froze in place before anyone saw it, and caused everyone playing goalie at that end of the rink untold troubles. “I want to play forward this year,” Suzanna told Wil as she smoothed out a small plastic fold. “Aww, nobody on the other team will ever catch me,” Suzanna said. “Yeah, I know. But what about you checking someone on the other team?” Wil said. On the opposite side of the oval rink, Faye chattered with Lee Tennyson about speed skating while Agnes Findley dreamed of gliding around the ice in perfect figure eights. The Tennyson boys abandoned their posts on the perimeter in favor of practicing their victory dance steps after making a goal. Plans, dreams, and visions of victory soared high over the chug of the water pumps when suddenly, Faye realized she could see the features of Brian Muzzy’s face. She quickly turned away before he realized she was looking at him to see the colors of the sunrise reflected in the surface of the rink. Her intent gaze caught the attention of everyone else, and they all turned to watch. Andy Cooper wiggled the end of the hose he’d been directing to free it of any stray drops of water then extracted his phone to check the weather forecast yet again. “What’s the good word, Andy?” Ted called. A collective “woohoo” rattled around the green as the fire trucks reeled in their hoses before lumbering back to the station. Stephen slapped his soggy gloves against one another as the whole crew trooped toward the bakery to draw up schedules for hockey games, skating lessons for the kids, and to make room for general ice time for those interested in making perfect figure eights. The scent of steaming wool mittens and hats soon made its way up to the Bennett family’s second floor apartment. When Diana detected the odor, she stretched then turned over, a smile on her face. Ice season had begun in Carding, and if she timed it right, the bakery’s kitchen would be clean before she got downstairs. Thank you for journeying with me to Carding, Vermont. If you subscribe to my website, you’ll find a short story in your inbox every Thursday morning along with food photos and recipes from the Crow Town Bakery (on Fridays), and other green peak moments from Vermont (Mondays and Tuesdays).